Why Should you Winterize Your Car? Winter is fast approaching, there is no doubt about that. Alberta and Edmonton weather can be very unpredictable and the last thing you need is to be unprepared for the cold weather, freezing rain and snowstorms that we all dread. The best way to avoid any vehicle problem during the winter travel season whether you are close or far from home, is to plan ahead. Be prepared so you and your car is well equipped to handle the ice, snow and cold. Not only do you need to prepare and winterize your vehicles, you have to ensure that you are equipped personally with emergency tools, kits and personal items incase anything were to happen. One of the easiest and most effective things you can do to winterize your car is to get winter tires installed. When the temperature drops to 7 degrees Celsius or lower, summer and all season tires are less effective due to their composition. They harden up and therefore have less traction on ice or snow. The ideal situation is to change to winter tires, and to install all four. Have them installed at the beginning of October and leave them on till the end of April. Winter Tires are the safest and best tires to have for winter. The combined contact area of all tires is about the Size of an 8.5″ X 11″ sheet of paper. Temperature, ice and snow all have enormous effect on a tire’s ability to function. The last thing you need is to have to slam on your brakes and have your vehicle keep sliding. We’ve all had that heart stopping moment and the best way to avoid that is with winter tires. Not sure what winter tires you need? Lexus of Edmonton has highly trained and experienced tire technicians that can help you. 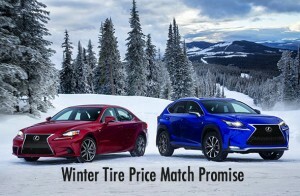 We also have a limited time offer where we will match any advertised winter tire price (including Costco) with the Lexus Tire Price Match Program. All Season Tires have lots of grip on dry and wet pavement. Its closed tread pattern can get clogged with ice and snow which makes it harder to drive and stop in winter conditions. When the temperature falls below 7 degrees celsius, the tire becomes hard and loses grip which can be dangerous in the winter. Winter Tire stopping distance on snowy and icy roads is 38% shorter than all-season tires. The wide Tread patterns can compress and release as the tires rolls. Rubber compounds remain soft in extremely low temperature which allows you to have more control of your vehicle. Do you have a Four Wheel Drive (4WD) or All Wheel Drive (AWD) Vehicle? There is a misconception that a 4WD or AWD do not see much benefit from Winter Tires. The reality is, the extra traction of four winter tires putting power to the ground increases the ability to accelerate, corner and brake more effectively compared to all-season tires. Our Tire experts at Lexus of Edmonton recommends winter tires on all vehicles, especially in Alberta including AWD and 4WD vehicles. If you would like more information, please call our Tire and Parts Department at 780-466-8300 or fill out the form at the bottom of the page so we can get in touch with you or CLICK HERE to learn more about our Winter Tire Price Match Promise. The easiest and simplest thing you can do is keep some simple essential supplies with you as you drive this winter. Supplies such as an emergency kit, spare tire, blankets, warm clothes, extra jackets and snacks is a good idea to have on hand. We also suggest having a shovel, flashlights, extra cell phone charger, booster cables, windshield washer fluid, extra gloves, flares, snow brush, ice scraper and more. It is very unpredictable of what can happen and it is best to be prepared incase of a breakdown, accident or during a snowstorm visibility is low. The battery is the most important aspect of your winterizing checklist. The cold weather weakens batteries and can leave you stranded. If the battery is over three years old it may be time to consider replacement. Winter months are tough on your engine and cause it to work harder, and this puts more pressure on the battery. If your battery isn’t that old, it is still good idea to take a look and make sure nothing’s wrong. Check the battery cables and clamps for fraying or corrosion. If there is a white, powdery substance around the clamps, that’s corrosion from battery acid — you can clean it off easily with baking soda, water and a toothbrush. Your battery is also filled with fluid, so make sure it has enough inside. Most batteries have caps on top, and you can check the level by removing the caps. If it’s low, fill the holes with distilled water, being careful not to fill past the bottom of the cap. Or, you can give us a call and our professionals can do that all for you. If your windshield has chips and cracks, we highly recommend you give serious consideration to replacing it. Dramatic differences in indoor and outdoor temperatures – called thermal shock – can turn a minor crack into a major visibility hazard if it starts to run. Often small chips can be inexpensively filled, saving you money in the long run. Lexus of Edmonton has in-house chip repair and windshield replacement. If you are not sure if you need your windshield repaired or replaced, swing by and our windshield specialist can give you an assessment of what needs to be done. It is also a great idea to get your windshield wipers checked as well to ensure there is no rubber that is cracked, split or deteriorated. The last thing you need is to be stuck in the middle of a snow storm and have your windshield wipers not work properly. Along with that, you should check your windshield wiper fluid and have it replaced with winterized one so it doesn’t freeze with the cold weather. One more thing that you should consider is the warmer weather when the roads get dirty. When the dirty slush hits your windshield it is more important to have proper windshield wipers and plenty of windshield fluid so you are able to see clearly through your windshield. It is recommended to have at least a half full tank of gas in the winter weather. The cold and constant fluctuation of temperature can cause condensation to form on the walls in the gas tank. If that occurs, it can cause water to drip down into the gas (which sinks to the bottom). If water finds its way into the fuel lines, it can freeze up blocking the flow of gas to the engine. The repairs can be very costly. Keeping a your tank full will help you car as well as your wallet. When did you last have the brakes inspected? If it has been six months or more, then it is time to consider having them checked and serviced to get ready for the long winter months. Book your Winterizing Package Today! A relatively quick winterization of your vehicle can ultimately save you time and money. More importantly, it could save you!